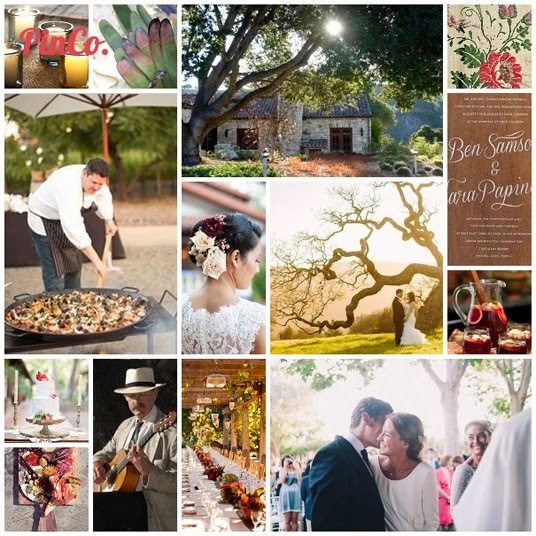 Inspired by Holman Ranch, I put together an idea board for a Spanish-themed wedding in Carmel Valley. This is the kind of event that I love to attend: unfussy with a focus on excellent food, a beautiful setting and a few memorable details. This wedding makes the most of the Spanish-colonial style of Holman Ranch, and the laid-back elegance of the grounds. 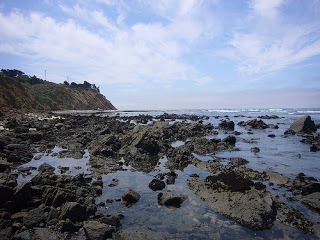 Location: Holman Ranch in Carmel Valley, California. If you rent it for the weekend, your families can stay in the property’s 10 hotel rooms and relax for a few days by the pool. Invitations: White ink on real wood is memorable and elegant without being too theme-y. Decorations: A few candles in recycled glass votives, a few flowers, some lights. You don’t need much when the venue is already so pretty. 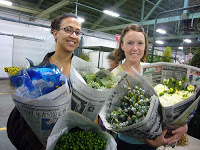 Food: Some of the best weddings I’ve attended had a menu focused on one “showpiece” dish. For this wedding, a massive paella with chorizo, crabs and mussels cooked over an open fire would be delicious and special. For appetizers (and guests who won’t eat the paella), serve a big spread of spanish tapas, cheeses, roast vegetables and olives. Another idea borrowed from a fancy San Francisco gala: have a caterer shaving a full serrano ham right on to your guest’s plates. Drinks: Sangria, wine and beer. Holman Ranch’s policies on bringing in your own caterer and alcohol are quite generous. They don’t charge corkage fees and include most of the tables/chairs that you would need to otherwise rent. Entertainment: Live spanish guitar in the courtyard while your guests eat. 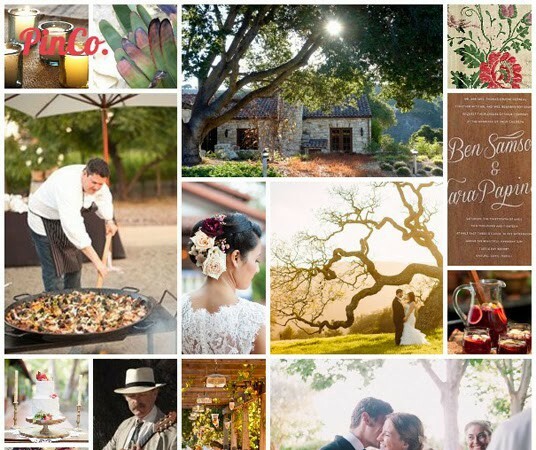 More Details: The complete pinboard for our Holman Ranch wedding is available online. And, if you’re looking for a planner, I happen to know that Jean Marks in Palo Alto is itching to hold something at Holman Ranch!